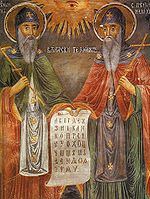 In the last third of the ninth century, the brothers Constantine-Cyril and Methodius embarked upon their mission to the Khazars, a Turkic polity that controlled parts of the Crimea and Black Sea region at the time, and the Moravians, a Slavic- speaking polity located between the Frankish and Byzantine Empires. As conversion mission, the Khazar mission is commonly regarded as a failure, whereas the Moravian mission is regarded as a success that paved the way for the spread of Christianity through the Slavic language. For the ultimate results of the Cyrillo-Methodian endeavor, one must go beyond Moravia, because when Methodius died in 885, his disciples were expelled. Methodius could not continue teaching without the patronage of the local ruler, which was easily lost in the midst of impermanent alliances of the ninth century. Similarly, the small number of conversions made by Constantine-Cyril in Khazaria were unconnected to the diplomatic success of procuring prisoners from the ruler of the Khazars. I reached this conclusion by comparing the two hagiographical texts, reading them through the lens of several conversion models. I make use of Richard Bulliet’s theory of individual conversion as social conversion.